Posttranslational modification of proteins: expanding nature’s inventory. changes that occur after messenger RNA code has been translated into the amino acid sequence code of nascent proteins. The text contains numerous examples of the role PTMs play in signal transduction and metabolism, and crisp color illustrations. PTMs(hereafter): Phosphorylation (pS/T, pY), Methylation, Deamidation, Oxidation, Nitration, N-glycosylation, Amino acid mutation, Unnatural amino acid, Chemical modifications, Palmitoylation, Glycosylation, Ubiquitination, SUMOylation, Dimethylation, Acetylation, Decarboxylation, etc.. Protein post-translational modification (PTM) increases the functional diversity of the proteome by the covalent addition of functional groups or proteins, proteolytic cleavage of regulatory subunits or degradation of entire proteins. These modifications include phosphorylation, glycosylation, ubiquitination, nitrosylation, methylation, acetylation, lipidation and proteolysis and influence almost all aspects of normal cell biology and pathogenesis. Therefore, identifying and understanding PTMs is critical in the study of cell biology and disease treatment and prevention. Protein post-translational modifications play a key role in many cellular processes such as cellular differentiation (Grotenbreg and Ploegh, 2007), protein degradation (Geiss-Friedlander and Melchior, 2007), signaling and regulatory processes (Morrison, et al 2002), regulation of gene expression, and protein-protein interactions. These modifications include phosphorylation, glycosylation, ubiquitination, nitrosylation, methylation, acetylation, lipidation and proteolysis and influence almost all aspects of normal cell biology and pathogenesis. Therefore, identifying and understanding PTMs is critical in the study of cell biology and disease treatment and prevention. 2) Post-translational modifications are key mechanisms to increase proteomic diversity. While the human genome comprises 20-25,000 genes, the proteome is estimated to encompass over 1 million proteins. 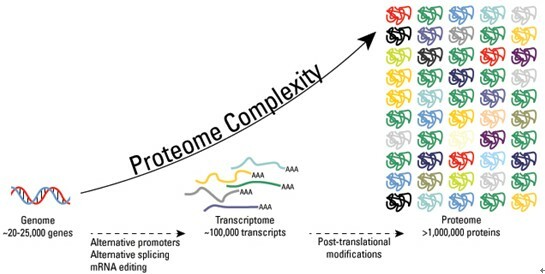 Changes at the transcriptional and mRNA levels increase the size of the transcriptome relative to the genome, and the myriad of different post-translational modifications exponentially increases the complexity of the proteome relative to both the transcriptome and genome. a) Some Modifications (Phosphorylations, etc.) are easier to find than others. We can look for specific modifications or unknown modifications. b) As a general rule, any post-translational modification (PTM) could be searched for in your protein as long as we know the mass added by the modification and the potentially modified amino acid (e.g. in the case of phosphorylation: +80 Da on a Serine, Threonine or Tyrosine). The easy way to look at protein is to present it as a by-product of DNA. However, protein must be viewed as central macromolecule in biology since; even DNA is made from building blocks by protein activity. DNA are the reservoir of genetic information that establishes amino acid in proteins. In normal living beings, normality defined by general health parameters whose values are inside an acceptable range of variation. Normal here is a statistical idea, as it must be and not as presented in recent years, as a living being that has a genome that does not have “glitches”, or a genome that would be defined as an ideal or a perfect genome. In line with this idea, protein receives the information that determines its amino acid sequence from DNA but have its conformation, activity and function derived from its ability to change its conformation in response to changes in its microenvironment and environment. These changes in conformation are in a form adequate to keep those parameters mentioned above inside the range that define the idea of normality in accordance with the condition in which the living being is, both in time (development) as well as in space. Therefore, post-translational must indicate a clear cut in the domain of DNA influence and not something, which is also derived from this DNA-centric view. This distortion of biochemistry has led to the never-ending genetics of non-genetic diseases. Genetics appears in inborn errors that are not acquired and show its effects in defects of proteins that could be established by a change in the DNA. Normality, or lack of abnormal genetic defect are perceived in all genomes that are able to maintain inside the normality range those parameters that define normal under defined circumstances. When this view is taken into account, DNA is take into account only when genetic diseases are considered. For the majority of the cases the scheme here presented must be made for each kind of cell, in each organ or system and the posttranslational changes thus, presented as function of development and/or a required fast regulatory change necessary to keep a cell and the organisms in general inside the normal range.